Last night, we attended a wonderful event: Pixar's "White Canes, Red Carpet," co-hosted by Guide Dogs for the Blind, The Blind Babies Foundation, and SF LightHouse for the Blind and Vision Impaired. The screening of their new film, The Good Dinosaur, included the debut of a new audio description app. The audio description was excellent: an app that you download and then listened to on your own device. May this be the future, but hopefully with a single app for all theaters or one that disappears after a screening rather than the predictable, American free-market scenario of needing to download a different app for every company. Thank you Pixar, Disney, and SF Lighthouse! The future looks promising for blind and low vision movie-goers! 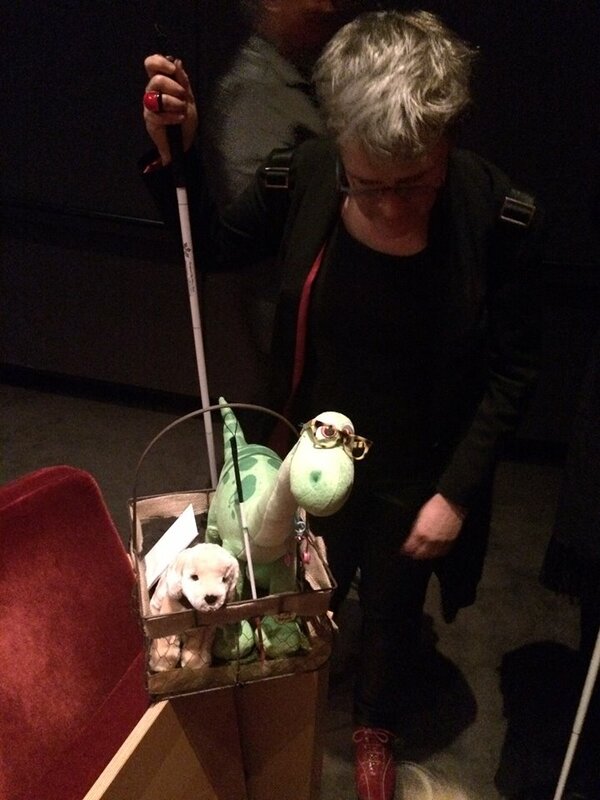 At the end, the blind organizations gave Pixar a 6-inch replica of the little green dinosaur Arlo with a tiny white cane, glasses, and service dog.